Produced by Elvin Bishop and Steve Savage Recorded and mixed by Steve Savage at Hog Heaven Studio, Lagunitas, CA Additional mixing at The Rumpus Room, Albany, CA Packaging designed by Kevin Niemiec Photos by Pat Johnson Mastered by Collin Jordan and Bruce Iglauer at The Boiler Room, Chicago, IL Booking: The Kurland Agency, agents@thekurlandagency.com, (617)254-0007 www.elvinbishopmusic.com Ever since Rock & Roll and Blues Hall Of Famer Elvin Bishop first hit the scene with the Paul Butterfield Blues Band back in 1965, he’s blazed his own musical trail. Whether he was playing raw, eye-popping blues, or penning the evergreen radio hit Fooled Around And Fell In Love, or touring the world for decades delivering his original, good-time countrified blues, Bishop has always inspired his fans with his rowdy guitar playing and witty, slice-of-life songs. 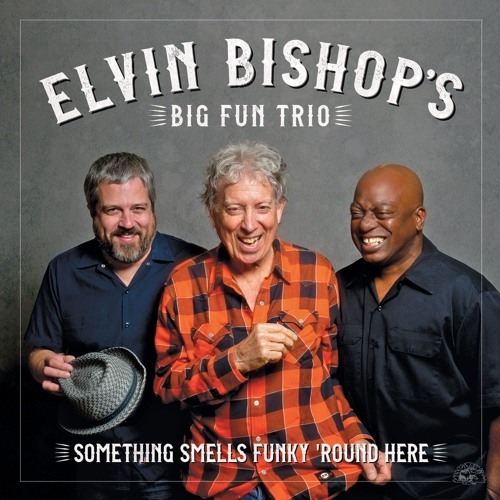 Rolling Stone calls Bishop “a legendary guitarist” whose playing is “impeccable and spirited...a distinguished American player.” Late in 2015, Elvin Bishop formed The Big Fun Trio, with Bishop on guitar and vocals, and his friends Bob Welsh on piano and guitar and Willy Jordan on cajón (a hand-played Peruvian drumbox) and vocals. After playing just a handful of live dates, the group’s instantly crowd-pleasing music and undeniable chemistry took the blues world by storm. With the release of their self-titled CD in 2017, media and fan response was immediate and overwhelming. DownBeat celebrated Bishop’s “verbal hijinks, outstanding guitar work and country boy friendliness.” OffBeat said The Big Fun Trio was “intricate, funky and uplifting,” declaring them, “consistently great.” With its top-shelf musicianship and front-porch vibe, the album earned a Grammy Award nomination, and won Blues Music Awards for Album Of The Year and Song Of The Year (for the title track) from The Blues Foundation. The Big Fun Trio quickly discovered the more they played live, the more fun they had making music together. So a follow-up recording was an easy decision. The new album, Something Smells Funky ‘Round Here, finds the group fearlessly laying it all on the line. According to Elvin, “With a trio there’s no place to hide­—you’ve got to be pourin’ everything you got right out front. You need to be totally into it all the time. It’s really cool to see how people react to the goin’-for-it feel of the music.” The album mixes rousing, new originals, reinventions of three Bishop classics and some unexpected, soul-shaking covers. Something Smells Funky ‘Round Here was produced by Bishop and Steve Savage and recorded at Bishop’s Hog Heaven Studio in Lagunitas, California. Bishop wrote or co-wrote five songs (including two by the entire trio). The potent title track—a tongue-in-cheek State Of The Union address as only Elvin can deliver— kicks the album off with Bishop aiming his lyrical truths at those in power. The humorous but piercingly direct lyrics take aim at the current political scene while Bishop’s deep blues guitar playing drives the point home.